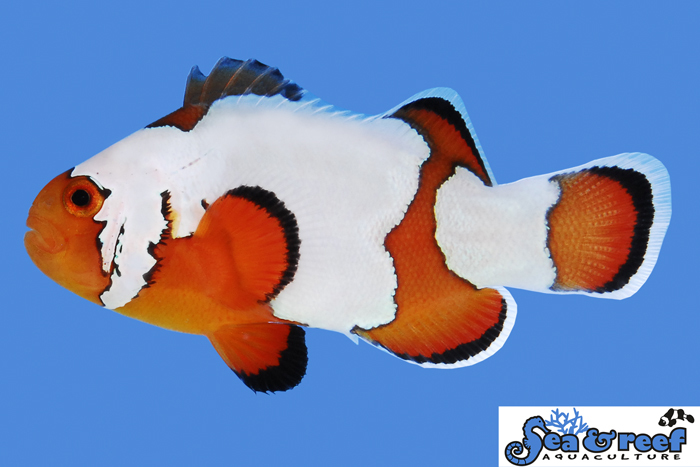 Premium Snowflake Ocellaris is a color variation of the regular Ocellaris Clownfish. Just like those super cooled droplets of water called snowflakes, no two of these unique fish look alike. The body color and general morphology of Snowflake Ocellaris Clownfish is similar to the regular Ocellaris Clownfish, but the stripe pattern is very different. The three white body stripes are exaggerated and have irregular shapes and patterns. Sea & Reef Aquaculture offers three different grades of Snowflake ocellaris Clownfish: Snowflake Ocellaris Clownfish, Premium Snowflake ocellaris Clownfish and Ultra Snowflake Ocellaris Clownfish. Grading of Snowflake Clownfish is based on the amount and shape of the white markings. Our Premium Snowflake Ocellaris Clownfish have more white markings than our regular Snowflake Ocellaris Clownfish and its head stripe and second stripe are joined on both sides of the body. The temperament and captive care requirements for Snowflake Ocellaris Clownfish are very similar to that of the regular Ocellaris clownfish. It is relatively peaceful and hardy. They thrive in saltwater aquariums with or without an anemone present. Premium Snowflake Ocellaris will readily accept a wide variety of host anemones and many hobbyists keep them with the popular and hardy Bubble Tip Anemone (Entacmaea quadricolor). As a reference the natural host anemones of the regular ocellaris clownfish are Magnificent Sea Anemone (Heteractis magnifica), Giant Carpet Sea Anemone (Stichodactyla gigantean) and Merten's Carpet Sea Anemone (Stichodactyla mertensii).